Artists, as they trust completely the inspiration of their artistic vocation, should never disregard nor betray the sense of their actions and their research and, by showing an affection and a fidelity to their own poetry and their own language – even to the unpredictable variations and tendencies that may come out – they need to connect themselves to their individual thinking and painting. Through the assiduous practice, that goes along with the urgency of communication of their soul, the singular individualism of Art shows a particular feature. If we talk about Painting – in this specific case we are obliged to capitalise the word – we can find this total devotion to their own work only in a few artists: with exception to the great masters who are still considered as guides for their path of experience extended in time, today the new generations of artists get lost in sweetening distractions of a sleek and fashionable world. The – young – artists don’t often talk about their works, art or their language or about the deepest meaning of their poetic survey, but they talk about galleries, the market, coefficients and speculation. Their statements debase in the general mercantilistic decline of this time. We need to recover the sense of acting, of practicing and making Art. The real sense of an innate practice, a gift to be expressed but also an action to be respected and that we need to think about. An action that has to mature through time. Raffaele Cioffi is an artist who doesn’t betray his mission; even though he belongs to the new generation of young but mature and committed artists, he never passes over the obstacle of reason by repeating an empty virtuosity but he pays attention to his vocation for painting, he always looks straight to and into his Painting. Painting again capitalised. If we think about him and his work, we could talk about a painter in the old style. Not for the subjects of his works but for his aptitude, for his forma mentis. I’ve often met him during the preparations for this personal exhibition and never outside his studio: with a fresh painting on his easel, some others to be finished, our words cannot help finding themselves in a different time – or too distant – from meeting in the presence of one of his works. Our dialogue takes place in presence of its object, with no digressions. Painting is always the statement, the principle. Painting is conceived as the first urgency. 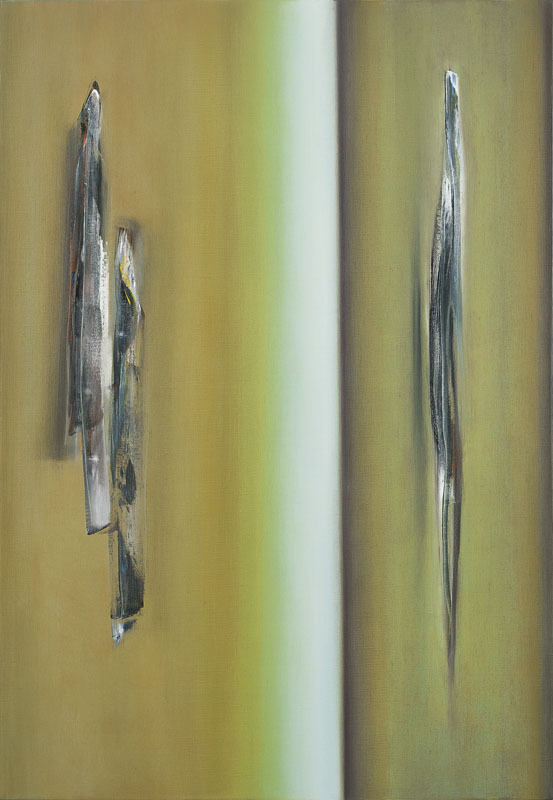 It’s not very difficult to find the strong character of his painting: Cioffi shows in each work the totalizing value of a complete attachment to the practice and more strongly, explaining the matter through his own language, the binomial canvas-colour is again the only means that express not an empty repetition of a tired motif but a happy meaning by which the chromatic universes of his own visions open wide and reveal themselves. In colour and its unlimited combinations Cioffi finds the space where he puts the bursting energy of his poetry; the passages of states and the hidden variations of each shade can raise and section the visual potential of an abstraction that doesn’t want to be a symbol but a meditation. The colour shrinks and softens in numberless passages of shades, it becomes less dense or hardens, it clots and decomposes in transparencies and glazings, it wanders in spaces and places otherwise imponderable. It goes into a world that bypasses the glance, both physical and mental, in order to render explicit its visual process. The interior, the unit that generates the superficial happening, reveals the potential secret of the colour that in Cioffi’s painting cannot be other than the substance of the emotional research hidden in the depth of his works. It seems a spatiality that goes over the two-dimensional shape of the canvas exactly into the digging, that could even become emersion, of the pictorial dermis. He doesn’t exclude from that the natural means of painting: we find again the wisdom of light, the practice of the substance, the knowledge of colour alchemy but the terms of their poetical suggestion urgent to express and to answer the experience that by now becomes the foundation of that emotional and cognitive growth we can see in the action of the provoking principle. The work is the infinite horizon of the recounting. The happening and the end of each work of the plausible and inexpressible world strengthen a process that makes the reciprocity of rationality symbiotic to irrationality, the automatism to the what is involuntary. The incidence of the vision of his Painting stays in declaring its sense in a moment that almost escapes every entirety of the logic: if his research is made in trying to control the formation of the colour, the colour, by eluding every interference, keeps on trying to strongly affirm his independency. In the same way the observer looks for a relationship, an intuition that could approach him to a far away sense from his truth and forces a new and deeper reflection. There’s no order or grade established in advance but the reciprocity of the tensions, in which the pigmented substance becomes a means of exchange, keeps on growing in the autonomous and instinctive contaminations. Cioffi’s painting reveals a biological and under the skin imponderability: this is the exploration of a longing and eager dissection of the operating chemistry turning into intellectual actions. The living and pulsing substance of the colour puts into concrete form the mixing of bright grazes of a way of feeling that, before being physically and physiologically perceived even if it is born and germinates in a comprehensible and sensitive field of life, probes the boundless field of mind, that means the indefinite world. The hidden mystery of what lays above the form. The real Painting – not the one obscured by the mere outward appearance, with no need to get confused or lost in quotations (Cioffi is however a great connoisseur of the History of Art and of its main representatives and their experiences) – finds a genealogy of its own affiliation and is always open to the derivation of the other. If Painting remains a place physically limited by the canvas, Cioffi starts a harmonic coordination by seeing, exploring, surveying every member, every fragment, every particle of his works; he brings his mind to a higher level. The happy rise of these thoughts, the will of investigating the restricted macrocosm of phenomena that, in the balance between what is physical and metaphysical, real or apparent, between the experience and the intuition, mould like actions involving the observer’s sensitivity. This is a Painting that reaches what is timeless and boundless and finds its total freedom in making spaces of contaminated expressions that stimulate the attention and revive the vision and steps up the application. Cioffi’s art is regenerative and conciliating for men and their minds. After due consideration, we must admittedly talk about Painting, the real one.